Wax covered bears sound odd enough, but they are cute additions to your home fragrance arsenal. Plush bears are coated in scented wax, and displayed in the open where the scent can be released. 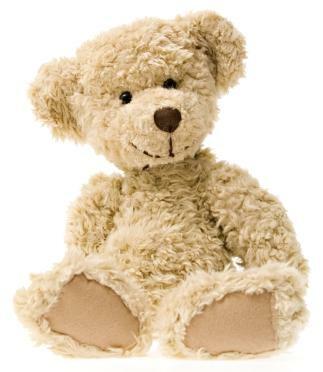 Teddy bears are universally recognized and loved, but these teddies are not toys. They are adorable air fresheners that release just a hint of scent in your home. Wax covered bears wear a coating of highly scented wax, which gets absorbed into the fabric and releases into the air. If you look closely you can see the wax on the bear's "fur," and the animal will feel waxy to the touch. While you'll use candle making supplies to create these bears, there is no wick because they are never meant to be lit. Instead they act in much the same was as a solid air freshener would. Wax-dipped bears are simple to make at home, without any fancy supplies. If you're a candle maker, you likely already have everything you need on hand, with the possible exception of the teddy bear. Here's how to make them. In a double boiler, melt the wax just as you would for candle making. Remove from heat and allow to cool for a minute before adding the scent. Stir gently to combine. Remove any bows, ribbons, or other items that might be attached to the bear. Using the tongs and wearing the gloves, dip the plush teddy bear into the wax. Move it around to coat completely. Remove the bear from the wax with the tongs, and gently press out any extra wax. Place the coated bear on baking rack with an aluminum tray underneath to catch the drips. Working quickly but methodically, comb the bear with a fork or wide-toothed comb to separate the strands and remove excess wax. Use a soft cloth or paper towel to wipe away the wax from the bear's eyes and nose. Pose the bear the way you want him to sit when he's displayed and set aside for several hours to dry. When the bear has cooled, add bows or any other accessories you'd like, and display it anywhere a little boost of scent is needed. If you're planning on giving the bear away or storing it, place it in a large zippered bag or other airtight storage container. Here are some tips to help with the crafting and usage of your wax dipped bears. Some fragrance oils and essential oils can stain white plush. Vanilla is a well-known culprit for this. Test your fragrances on an old plush animal before using. If you leave too much wax on the bear when combing, you'll end up with flakes of wax or large, hard chunks of it on the finished project. Take care to comb out all of the fur and fluff it up as much as you can. You can add a little bit of candle or soap dye to the wax mixture if you're using colored plush. Sometimes uncolored wax will leave a whitish film on the bear. You can add a touch of mica glitter to the wax if you'd like to have a sparkly finished bear, or try different animals besides bears. Wax coated plush will begin to lose its scent after a while. You can refresh the fragrance by directing hot air at the teddy bear with a hair dryer for a few minutes. Don't display the bear in direct sunlight or near a vent, as the steady stream of heat will melt the wax enough to cause a mess. Wax coated bears are a fun project with a functional result. Make some for your own home, and more for gift-giving. They also sell quite well at craft sales.